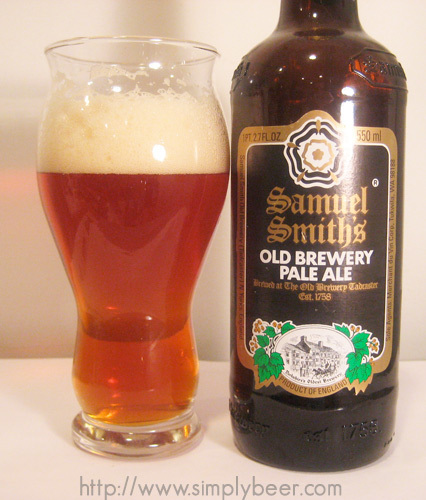 Since I had the Wychwood Fiddler’s Elbow English Pale Ale, I thought it would be fitting to have the Samuel Smith’s Old Brewery Pale Ale right after to get a good appreciation for the two English pale ales. This poured a huge head, a slightly gentle pour would be prudent or you’ll end up with a 3 inch head. Beer is a nice golden color with red hues which are really accentuated by the clarity of the beer. Great head, good head retention, and some lacing. More malty then anything, also a bit earthy. A malty beer, dry with some spicy hops. A bit grainy and had a bit of caramel sweetness. A good English Pale Ale, a bit spicier then I would have expected. 5% abv makes this a pretty easy drinking session ale, b ut it was a bit thin.